This women's cycling shirt will be your favorite cycling gear from now on. 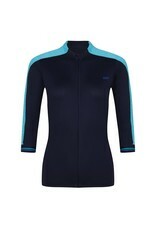 Susy cyclewear is the only brand that offers women's cycling shirts with three-quarter sleeves. 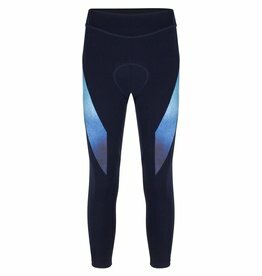 And that while three-quarter sleeves are ideal to wear during your cycling trip in the Dutch or Belgian climate. 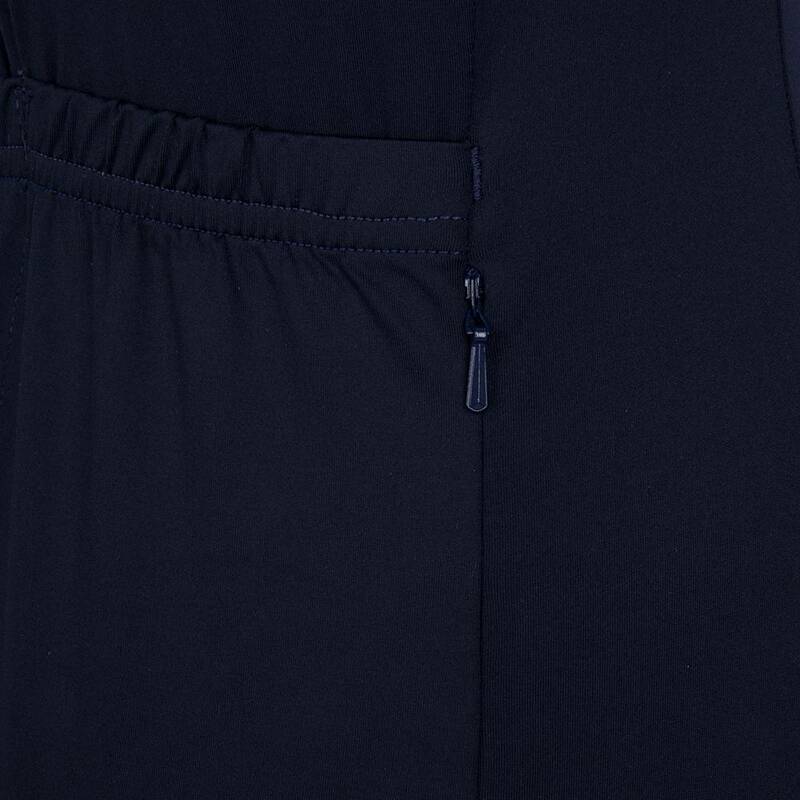 The length of the sleeve is elegant and contributes perfectly at 15-20 degrees. 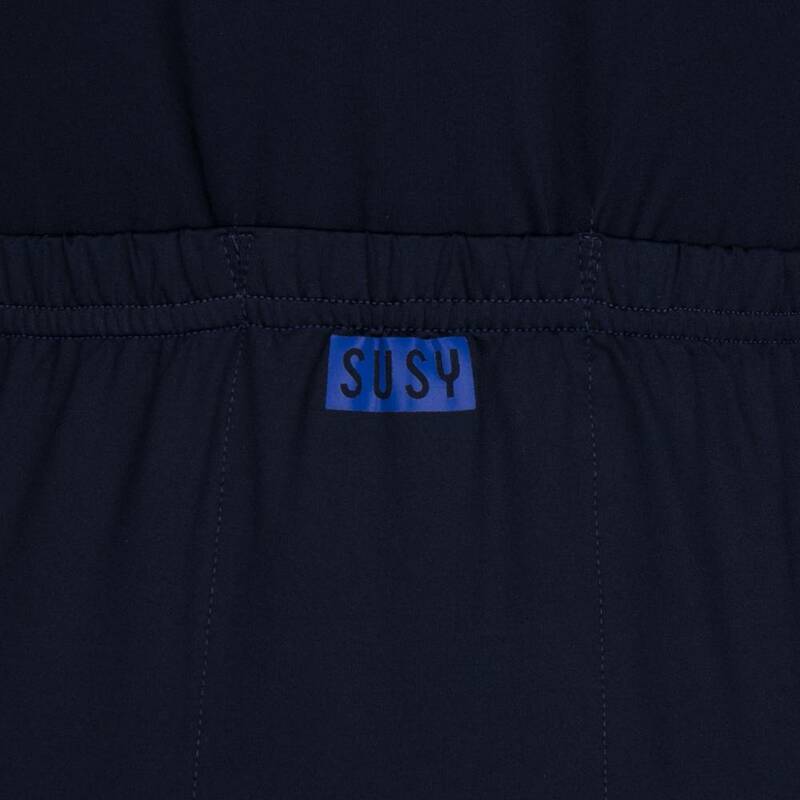 This women's cycling shirt from Susy is based on the 2017 model. 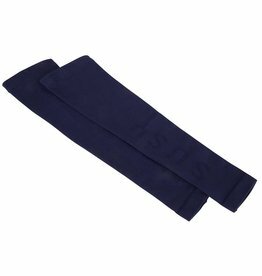 However, the sleeve insert is a normal sleeve insert instead of a raglan sleeve. In addition, the collar is continuous for an even more elegant and stylish effect. 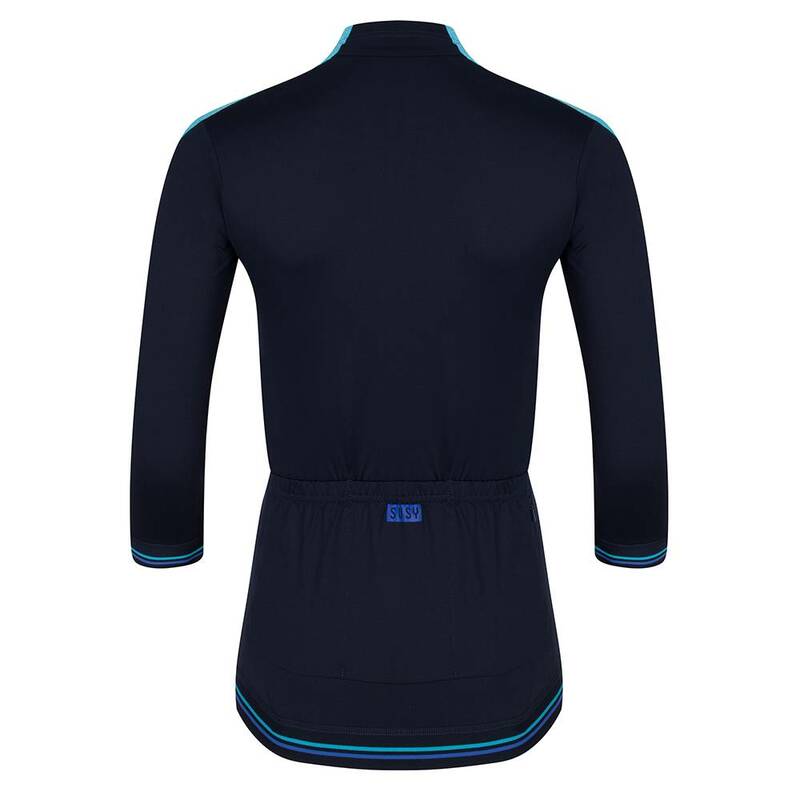 The ladies cycling shirt has a back length of about 62 cm. 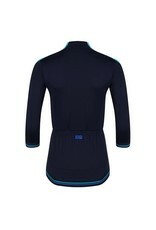 The bottom and the sleeves are trimmed with a beautiful retro elastic band with a stripe detail in aqua and blue. This elastic band can be found in our new ladies cycling clothing collection from 2018. The back of the band contains special silicone which ensures that it is stiff. 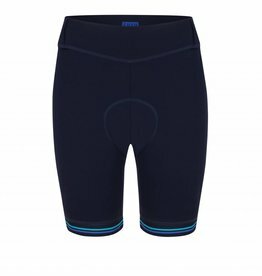 This keeps the back and sleeves in place while cycling. 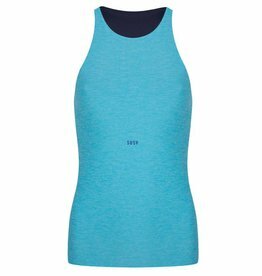 The sleeves of the ladies cycling shirt have a contrasting fabric of aqua blend. This is a fresh and cheerful color aqua that is beautiful with every woman. The rest of the cycling shirt is night. 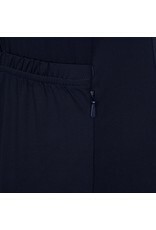 This color is between black and dark blue and can be easily combined with other ladies cycling clothing. 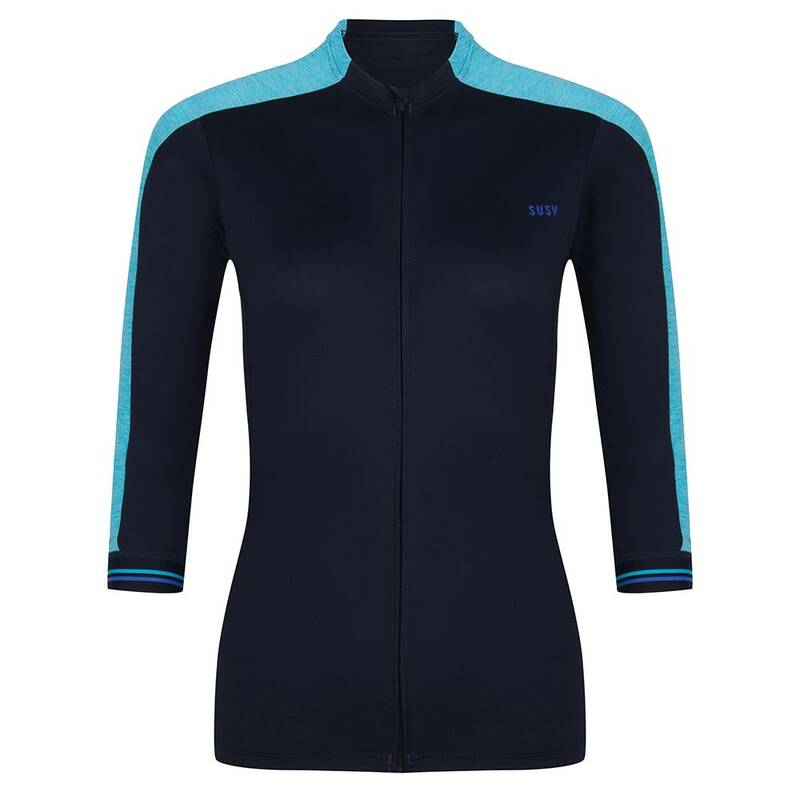 The women's cycling shirt is made of high quality Italian breathable fabric and instantly wicks sweat. -Good compression of the muscles while cycling. -UV filter with SPF 50+. At the top of the collar there is a chin protector (triangle of fabric) so that the zipper does not rub against the skin when the ladies cycling shirt is worn. .
An automatic sports puller has been used. This ensures that the puller stays down and does not ring during your bike ride. The ladies' cycling shirts offer a lot of storage space. The back has three standard back pockets. In addition, a phone pocket is incorporated in the side seam of the ladies cycling shirt. The phone pocket is to close the zipper. 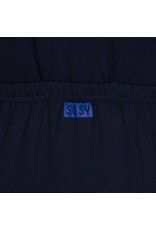 All blue Susy logos are reflective and ensure that you are clearly visible in the twilight. The Italian fabric is manufactured in Poland. 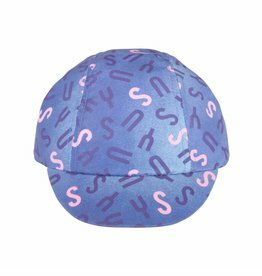 The Susy women's cycling shirt falls immediately and falls a bit smaller. Uncertain about the size? Then take a bigger size. Then follow our advice regarding dimensioning. The size of the waist is the most important thing to follow.